Teachers play a critical role in ensuring that students learn in the safest and most affirming environment possible. Findings from our 2015 national survey of secondary teachers and students,* a follow-up to a survey we conducted 10 years ago, provide valuable information about how educators are addressing bias in their schools. To that end, the findings highlighted below focus on teachers' survey responses and offer insights into what challenges remain. Approximately half of the teachers believed that bullying, name-calling, or harassment was a serious problem at their schools.Overall, teachers reported that students felt safer in their schools, and also reported lower incidences of biased remarks, than teachers surveyed in 2005. Yet these more positive perceptions did not hold true for safety and bias related to race/ethnicity and religion. Most teachers surveyed reported intervening at least sometimes when hearing biased remarks; they did so most often with sexist remarks and least often with negative remarks about transgender people. While at least half of teachers reported being very comfortable intervening in all types of biased remarks, they were most comfortable intervening in negative remarks about ability, and least comfortable intervening in negative remarks related to gender expression and transgender people. Most teachers also reported feeling comfortable addressing bullying behaviors, but they were most comfortable addressing bullying based on race or religion, and least comfortable addressing bullying based on a student's actual or perceived sexual orientation or gender identity/expression. Teachers surveyed in 2015 reported intervening in biased remarks less often than did teachers surveyed in 2005. This change may be a result of the change in their comfort levels in intervention. Teachers in 2015 may be less prepared for handling these behaviors among their students, which could indicate a continuing, and perhaps greater, need for professional development. Supportive LGBTQ Practices. The overwhelming majority of teachers surveyed felt that teachers and other educators had an obligation to ensure safe and supportive learning environments for LGBTQ students. However, this sense of obligation did not always translate into action, with only about half of teachers reporting having engaged in any LGBTQ-supportive practices. Most commonly, teachers indicated that they had worked directly with students by providing one-on-one LGBTQ student support and discussing LGBTQ issues with students, and were less likely to report engaging in activities that may have a broader impact on school climate, such as including LGBTQ people or topics in their curriculum, educating other school staff, advocating for inclusive policies, or advising a Gay-Straight Alliance or similar student group. Professional Development. Our findings highlight the importance of professional development in helping teachers become more aware of the bias students face in schools and better equipped to respond. As shown below, teachers who had received professional development on diversity/multicultural education or on LGBTQ student issues reported intervening in biased remarks more often and were more likely to engage in LGBTQ-supportive practices. 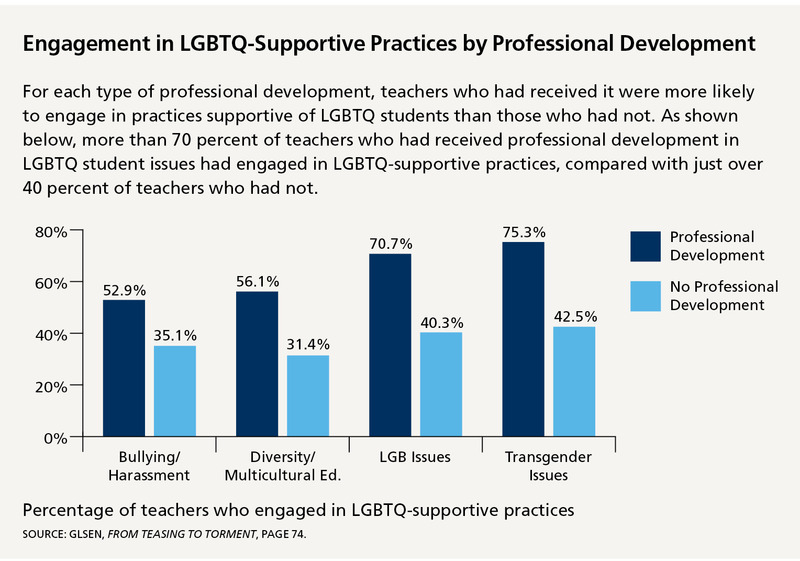 The effect of LGBTQ-related professional development on LGBTQ-supportive practices was particularly striking. However, teachers were unlikely to receive this type of professional development in their pre-service training or when working in schools. Although over three-fourths of teachers said they had some type of professional development on diversity/multicultural education, less than a third said they had received any training on LGBTQ student issues. Teachers in schools with enumerated LGBTQ policies were more likely to have received professional development on issues related to LGBTQ students and on diversity/multicultural education. However, further analysis demonstrated that professional development on bullying that does not include content on diversity or LGBTQ student issues does not necessarily lead to an increase in LGBTQ-supportive efforts. Teacher Characteristics. Although few teachers reported incorporating LGBTQ people and topics into their teaching, those teaching English or history/social studies were more likely to do so than those who teach in other subject areas. This pattern held true for most LGBTQ-supportive practices as well, suggesting that more attention should be given to helping teachers of all disciplines address anti-LGBTQ bias and support LGBTQ students.